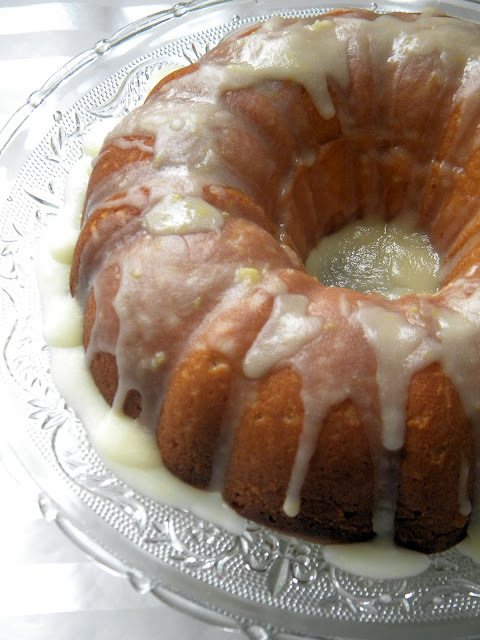 Every Italian-American woman I know (who is - ya know- into being an Italian-American) has a special occasion lemon cake recipe. They can make them in less than an hour* and always have the ingredients stocked in their kitchen just in case one of those special occasion sneaks up on them. 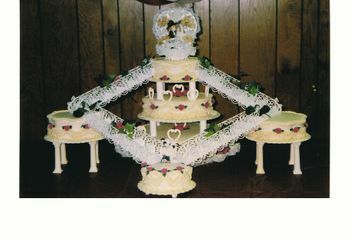 You can find these cakes at baby showers and given to neighbors who have just lost a loved one. They're at PTA meetings, church potlucks and office parties. I would bet cash money there is at least one sitting in a Knights of Columbus right now. But I think you've figured out by now that these cakes aren't the headliners like those 4 story wedding monuments to buttercream. They're like the universal cake soldiers. They're around to feed nervous bridesmaids before the wedding. They're something to pick at while you're staying up to go to Midnight Mass at Christmas and they are always around this time of year for those folks who gave up chocolate for lent or just to be enjoyed with coffee after church. I have always loved these simple lemon cakes**. So you can imagine how happy I was to find that Betty had a recipe for one those beloved little cakes for us to include in our project. Thank you Betty for being awesome yet again! This is a pretty moist cake - so be prepared for that. Half of this cake is going to work with Dan today for those folks over at Peta2 to enjoy... because really I don't think that Dan and I need to eat an entire cake. There is also a PS at the end of this post that is not really vegan cake related but very important. I couldn't really find a way to fit into this post except to plug it at the end - but I hope you will click on the read more link below and check it out. Back to the cake recipe you've always wanted to complete your arsenal! In a large bowl, blend your Sugar and Margarine with a hand held electric mixer on a high setting until it is smooth and fluffy. Then blend in Applesauce and Ener-G Egg Replacer. In another bowl, mix Flour, Baking Soda and Salt with a whisk until completely blended. Then add the Flour mix to the Margarine mix a little at a time - alternating with Coconut Milk. Each time you add some Flour or Coconut Milk, use your mixer to blend it in completely. Once your Flour and Coconut Milk are completely blended in add your Lemon Zest and Lemon Juice and blend on a medium setting for 2-3 minutes. You want your batter to be fluffy and smooth. Spray a fluted tube cake pan with Baking Spray. Then pour your Batter into the pan evenly. Use a spatula to spread it out to make a nice even layer. It's important to make sure the Batter is even because the cake will be sitting with the rimmed ring on top. So if you see any ridges or clumps be sure and smooth them out now. Put in the oven and bake for 45-50 minutes. Now not every fluted cake pan is the same and some are deeper than others. So start checking on your cake at around 30 minutes. Use a bamboo skewer to test if your cake is done. If you can poke the bamboo skewer in a few times and remove it cleanly. You're done. 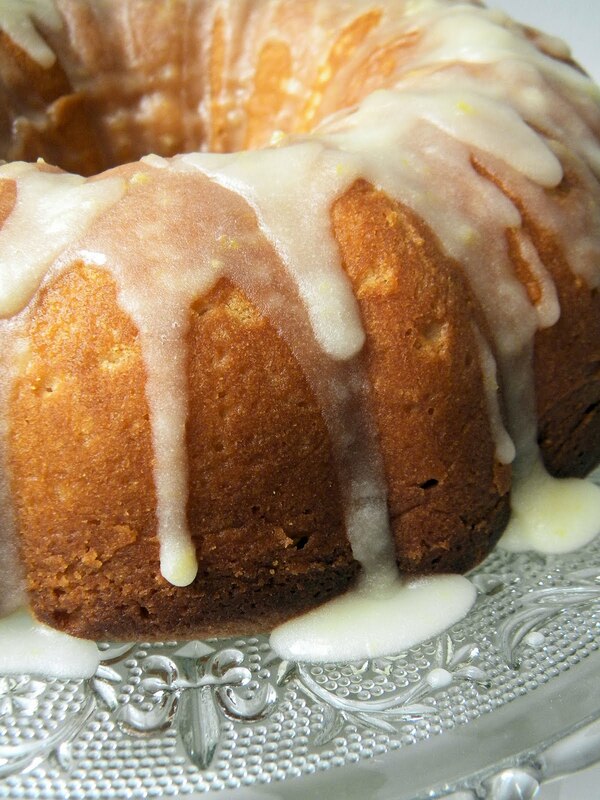 While your cake is baking, make your glaze. In a saucepan, melt your Margarine on a low heat. Once your Margarine is melted, use a whisk to blend in your Powdered Sugar. Then blend in Lemon Zezt and Lemon Juice. The glaze is pretty sweet. If you taste it and are like this is too sweet for you - just add a little more melted Margarine and Lemon Zest until you get the flavor you like. You're going to want to keep your glaze warm till you drizzle it over the top. Pull the cake out once it is fully baked and immediately poke your cake several more times - like 15 times with the bamboo skewer. You only want to go in about as deep as a fork would go. You're releasing moisture from the cake to help it cool and also release from the pan. 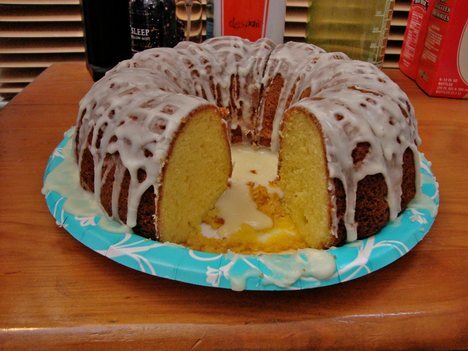 Let your cake cool for 20 minutes and then turn your cake pan upside down on a large serving dish. Now drizzle the warm glaze over the top and let your cake cool. 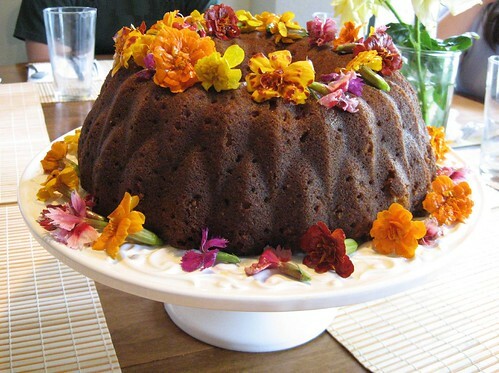 In the springtime - it's nice to decorate lemon cakes with edible flowers. I couldn't find any this time. Pity. *Sorry this one takes longer to bake because there isn't any eggs but is much better for you and for those poor birds. **I'm not sure if I ever really thought I would have a husband but now that I do - I can't explain what it means to me to be able to make one of these cakes for him. It's made my DNA happy. The Not Cake Related PS - Mercy For Animals has a new undercover investigation into abuse on a dairy farm in Texas - especially the way they handle the baby calves. This video is extremely upsetting and hard to watch but if we don't share this information with others - well - it will never stop. Please take just few minutes to share this information with others. Thank you. Moist cakes are the best cakes!! Wow I just watched the link...I am appalled at the treatment of those calves.thanks for posting it.I am a new vegan myself and watching those images makes me KNOW this is the right choice!! I made this cake on Easter . Chillllleeeeeee....... this was the best vegan cake I have ever baked. It was perfect! I thought I had coconut milk but I used it a few days prior soooo.. I used soy milk and it worked well. It was a hit with my family and I am making this cake again for my church and my daughter's school picnic in a few weeks. This cake is amazing. I'm not a citrus person, but for some reason I was craving lemon for a few days when this showed up in my email. I finally made it today and it was a hit with my skeptic omnivore hunny and my 3 and 5 year old. Couldn't keep my girls away. They devoured their share so far. 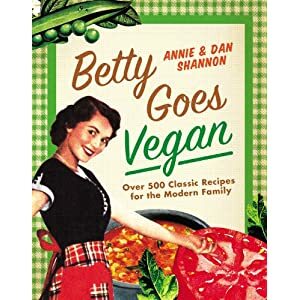 By far one of the best vegan recipes I have come across yet. Thanks!